Friday, April 26, 2019 from 10:00 a.m. to 2:00 p.m. for more information please click HERE. The effort to restore the Saginaw Bay sturgeon population began in the 1990s with habitat restoration efforts, dam removals, and education. Beginning in 2018, a broad partnership of agencies, nonprofit organizations, schools and more, took the first step of releasing more than 1000 juvenile Lake Sturgeon into four Saginaw Bay Watershed rivers: Cass, Tittabawassee, Shiawassee, and Flint. The Lake Sturgeon is known as a ‘living fossil’ as its evolution dates back 250 million years. Their historic range includes large rivers and lakes in North America, and the Saginaw Bay, Michigan is central to each of its life stage. In the early 1800s, Lake Sturgeon was common to all of the Great Lakes, but sturgeon numbers declined due to habitat degradation and commercial exploitation. Today, the Saginaw Bay has what is considered to be a "remnant" population. For the first time, Lake Sturgeon are being released into the Saginaw River system. ‘living fossil’ to their home. Baby Lake Sturgeon are hatched and raised in a fish hatchery near Black Lake, Michigan which still has a small native sturgeon population. Baby sturgeon need to grow to be 5"-8" in size before they can be released into native streams. The Black Lake chapter of Sturgeon for Tomorrow is covering the operating costs of the hatchery and DNR Fisheries maintains the health of the juvenile fish - but we need to cover the added costs of feeding the fish destined for the Saginaw Bay rivers – the cost of the food is estimated to be about $2,500 a year for each of the next 10 years till 2028. Please consider making a tax deductible donation to help feed these baby fish to grow large enough for release to our own waters flowing to the Saginaw Bay. 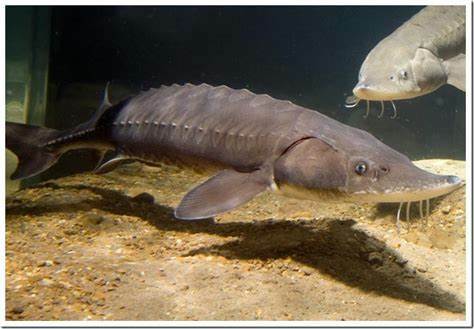 To donate online or help become a part of the effort to return this threatened species to their home, visit our website and the Support tab at: Saginaw BaySturgeon Restoration website. The Bay Area Community Foundation will be hosting the 1st Annual Harvest Hustle 5K and 10K races on Sunday, September 29, 2019. Run for the trails and support the Trail Maintenance Endowment Fund. Click HERE to view the race trail map. Registrations are now being accepted for Harvest Hustle! You can register for the Harvest Hustle by clicking on the HARVEST HUSTLE LINK or by going to www.itsyourrace.com. Huron Pines made history when Executive Director Brad Jensen signed the title to an 80-acre property near Hubbard Lake that is now the first piece of protected land to be owned outright by Huron Pines. The 80-acre Hubbard Lake Preserve includes two miles of trails for hiking, snowshoeing, cross-country skiing and wildlife viewing providing yea-round recreational opportunities to local residents and visitors. Please click HERE for more information on how you can help to support for first Huron Pines nature preserve. Treatments to control infestations of the invasive weed Phragmites may be done between August 25, 2018 and December 31, 2018 along the Saginaw Bay shoreline in Bay County. Weather conditions favorable for the treatment will dictate the exact date and time of treatment. Land based treatments will be done by Wildlife& Wetlands Solutions, 4371 N Long Lake Road, Traverse City, MI 49648 . The treatment areas are located along the Saginaw Bay near shore areas in Pinconning and Hampton Townships of Bay County, Michigan and the Property Owners in the spray areas have been notified. Phragmites Chemical treatment will be done with a mixture of the products Aqua Neat and Habitat which are aquatic formulations with the active ingredient pesticides Glyphosate and Imazapyr. These are non-selective herbicides that can cause damage to any plant that they contact. People and pets should avoid contact with the treated areas until spray solution has dried (approximately 6 hours) to prevent transfer of the spray product onto desirable vegetation. Surface water in treatment areas should not be used for irrigation for at least 24 hours after treatment. Mowing of dead Phragmites will also be done two or more weeks following chemical treatments using a Marsh Master. While Phragmites control in these areas is a priority, there are no dates scheduled for treatment at this time. Landowners in proposed areas must complete and sign a Landowner Authorization Form to allow Bay County to provide Phragmites Treatment to this area. Maps of treatment areas and labels of the spray products to be used may be viewed by clicking the links below, or at the Bay County Environmental Affairs & Community Development Department located on the 5th floor of the Bay County Building located at 515 Center Avenue, Bay City, Michigan 48708. This project was funded in part by the Michigan Invasive Species Grant Program. Any questions should be directed to Laura Ogar, of the Bay County Environmental Affairs and Community Development Department at 989-895-4135 or via email at ogarl@baycounty.net. It's summer time! Be prepared before you head out to your favorite beaches and rivers. New MDEQ Minute video gives info on what causes beach closures and what you can do to help keep them clean and safe. Click HERE to view the video. While we routinely summarize our annual work activity for internal performance monitoring, beginning this year we will start posting the annual report on our webpage in accordance with County Executive Jim Barcia’s priority for greater outreach and communication with the community. We are proud of the work performed by the Environmental Affairs & Community Development Department through the divisions of Geographic Information Systems(GIS), Transportation Planning, the Gypsy Moth Suppression Program, Mosquito Control Program, and work by the Department Director on Community Initiatives and Saginaw Bay improvement activities such as DNR Grants for Phragmites control along the shoreline, water quality improvements, and greater public access to the bay, notably the 320’ of Boardwalk at the Bay City State Park. We look forward to serving the residents of Bay County throughout the coming year. Welcome to the Bay County’s interactive map of Pinconning Park located in Pinconning, Michigan. Pinconning Park is a 137.3 acre County park and campground located on the shores of the Saginaw Bay of Lake Huron. The park is open year round and is a popular spot for hiking on over 5 miles of nature trails, bird watching, fishing, kayaking, swimming with sandy beach at the site and picnicking in the Day Use area. A private concession rents kayak right on the beach at the park. The Park Office hours during peak season, mid-May through mid-September, are 8:00 a.m. to 10:00 p.m. During the off-peak season, from mid-September through mid-May, the Park Office is open from 9:00 a.m. to 4:30 p.m. The Park Office is closed only two days a year, on December 25th and January 1st. There are campsites and cabins available for rent year-round, and most of them are ADA accessible. The park has a $3.00/day or$15.00/year parking fee to gain entrance and additional camping fees apply. There is also a boat launch available for use for $4.00/day. Further rental spaces at the park include a pavilion and waterfront gazebo. To view the different campsites or cabins available at the park on the interactive map, just scroll over the spot and a pop up photo will appear. For more information please go to the Pinconning Park website. RadNet stationary air monitors measure gamma radiation emitted from air borne radioactive particles as they collect on the monitor's filter. The monitors transmit these real-time gamma radiation data each hour to EPA’s National Analytical Radiation Environmental Laboratory (NAREL). These data are viewable on the "Gamma Gross Count Rate" tab. With its land and waterscapes evolving through the interacting forces of water, geology and climate, Lake Huron and its watershed have been shaped into an area of global ecological significance. Lake Huron is renowned for its beaches, dunes, rugged shorelines, coastal wetlands, diverse river systems, forests and more than 30,000 islands. Conserving this precious resource is important to maintaining its enormous social, recreational and economic benefits. An innovative way to help Bay County businesses save money, create jobs, grow the tax base and green our state! On March 10th, the Bay County Board of Commissioners voted to approve Resolution 2015-45 to officially join the PACE (Property Assessed Clean Energy) program. A resolution was previously adopted by the Board of Commissioners on January 21, 2014 with the intent to create a program aimed at sharing opportunities for energy efficiency with local business through the development of a PACE program in Bay County. PACE was created through Act No. 270, Public Acts of Michigan (2010) for the purpose of promoting renewable energy systems and energy efficient improvements for eligible local businesses. Following this, a public hearing was held on the matter on February 11, 2014. The PACE program has identified improvements, renewable energy systems and energy projects within the Bay County PACE district. Your guide for non-motorized routes and outdoor fun in Bay, Midland, and Saginaw counties in the state of Michigan! The Tri-County Trail Guide is available HERE. An interactive guide outlining important trail information and resources available at each trail location is available here. 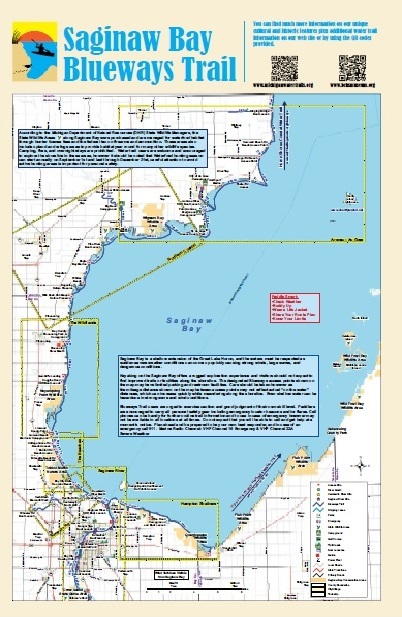 This trailways mapping project was made possible by the Saginaw Bay Watershed Initiative Network (WIN) in cooperation with the Bay Area Community Foundation, Midland Area Community Foundation, and Saginaw Community Foundation. The Saginaw Bay is the unique feature defining Michigan's mitten and is easily seen and recognized on satellite photos of the Earth.Come see what it looks like up close along the coastal Blueways trail.White sandy beach shorelines small cottages and big houses are interspersed by large natural coastal marsh areas and provide the full variety of a coastal paddling experience. For more information on the Saginaw Bay Water Trails, please check out the LIAA Michigan's Great Lakes Water Trails Website. The Great Lakes Shore viewer provides professional color photography of every inch of coastline (and many islands) in the Upper Peninsula of Michigan (Lake Superior, Lake Michigan and Lake Huron). Each coastline photo also has a series of maps showing important natural features for planning and protection efforts. For more than a decade, the Saginaw Bay Watershed Initiative Network has worked to support the concepts of sustainable development in the Saginaw Bay Watershed -that interaction between our economy, our communities and the environment. In 2015, WIN and its partners continued to strategically invest in critical projects across our region, bringing our historic total to more than $5 million, and leveraging more than $11 million. From our support of river restoration and nonmotorized trails to investments in pollution prevention and recreation....2015 was a busy year in support of our mission of regional sustainability. Learn more about WIN - and the projects supported this year - by downloading the Annual Report! Aerial spraying to control the invasive plant Phragmites, is set to take place one time during the period between September 15, 2011 and October 15, 2011 along the Saginaw Bay shoreline adjacent to Bay County’s Pinconning Park and Fraser Township’s Linwood Scenic Park, at the east end of Linwood Road. The exact date is unknown at this time as aerial spray treatment is weather dependant, with favorable conditions of light winds with moderate humidity. The aerial treatment will be done by helicopter as this was determined to be the most effective method to reach the shoreline area and can target stands of phragmites only. An herbicide mixture of the products Habitat (Imazapyr), and Aqua Pro (glyphosate) a surfactant will be used to treat only those areas of Pinconning Park and Linwood Scenic Park area that have dense stands of phragmites. This mixture is specially formulated to be targeted to plants and safe for use in aquatic ecosystems near waterways. There will be a 24 hour water use restriction at the treatment area, so signs will be posted against swimming and/or wading at the site.Bay County Environmental Affairs and Community Development received a grant for phragmites treatment at the Pinconning Park location from the US Fish and Wildlife agency. Please note that a separate but similar spray application will be done about the same time at the Nayanguing Point area by the Michigan Department of Natural Resources.Any questions should be directed to Laura Ogar, Director of the Bay County Environmental Affairs and Community Development Department 989-895-41356 or via email at ogarl@baycounty.net. The General Permit is available for viewing by clicking HERE. The Saginaw Bay Coastal Initiative (SBCI) holds monthly meeting on the 3rd Thursday of each month from 1:00 p.m. to 3:00 p.m. at the Bay County Building, 515 Center Avenue, 2nd Floor Old Commission Chambers, Bay City, Michigan. The SBCI Group does not meet during August and September. For more information about the Phosphorus Ban, please click HERE. This table (in PDF Format) is the current cost and calculated grant savings from the Bay County LED Energy Efficiency Grant. Energy Savers Booklet: Tips on Saving Energy & Money at Home. This booklet shows you how easy it is to reduce your energy use at home and on the road. Michigan Green Schools is a nonprofit agency dedicated to help Michigan Schools with their environmental goals. Michigan Green Schools is a program designed for both public and private schools to help them achieve environmental goals including protecting the air, land, water and animals of our state along with world outreach through good ecological practices and the teaching of educational stewardship of students pre-kindergarten through senior high school.